Leaving school this afternoon, I drove my Jeep out into a beautiful world, awash with Texas sunny skies and temperatures at 71 degrees with cool breezes filling the air. I slipped a Beatles Anthology CD into my player and listened to the three different renditions of Strawberry Fields Forever. I felt a sense of sadness, realizing that I miss John Lennon more now than I did in the immediate years following his untimely death. Maybe I lacked maturity in those days, but his death was a sensationalist event in the media and I never really felt the sense of sorrow and loss until much later. Now, I have trouble listening to Imagine and Strawberry Fields. As the song played, my mind’s eye was filled with this image from Stovall Park in south Arlington, Texas. I drove to the park, got out of my Jeep and walked to this location, and as I gazed at the tree in the late afternoon sun, the muse whispered sweetly and gently into my ear, and I knew I had to give it a shot. I must say the muse was with me this time, as I felt genuine joy working on the piece, though I only lingered 45 minutes over it. I was intrigued with the darkness and density of the tree, with the sun behind it, and the contrast of the yellow, sunlit leaves in particular places. I also felt stirred at the dark lavenders and crimsons I sensed in the sprawling shadows beneath the spreading tree. The only part at which I labored the most was the dark density of the body of the tree top, trying to find the right kind of blue tones to put into the shadows. I’m not sure that I got it right, but I think I have improved over past attempts at painting trees en plen air. I hope I can find a way to do it tomorrow as well. My dreaded 4-class school schedule will hold me until nearly 3:00, but maybe I can get away quickly enough to capture the afternoon light again. The Bob Phillips Texas Country Reporter Festival on the town square in Waxahachie was a fabulous success. The bright sunny weather featured cool breezes that held the temperatures in the low-70’s and the ten-hour festival blew by fast. It was my third consecutive year to have my booth in the VIP section on Franklin Street, just in front of the main stage, and the time spent with my friends and patrons from past festivals was exhilarating. I am posting a watercolor that I did of two businesses on College Street (also on the square) that unfortunately burned last year and have been torn down. During breaks in the festival proceedings, I turned a sad eye on the ruins where these two businesses formerly stood. 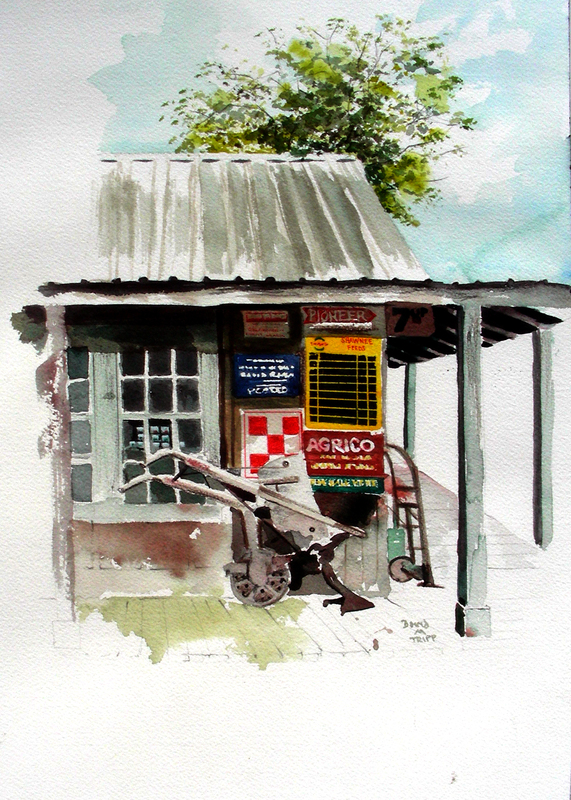 The law office had purchased this watercolor back in 2009 at the close of the Paint Historic Waxahachie event, my first time to participate in that plein air enterprise. That event actually marked the beginning of my own plein air odyssey. So, to look on this painting, and to travel to Waxahachie to see the ruins, fills me with a sense of sadness, as well as gratitude for the poignant memories left by that site. I am still selling plenty of greeting cards of this image, so the residents apparently still cling to the memories as well. Maybe all of us can take pages from William Wordsworth and Marcel Proust, who wrote of those primal memories worth carrying with us. Oftentimes, we look back and find defining moments in them, that otherwise may have passed into oblivion. 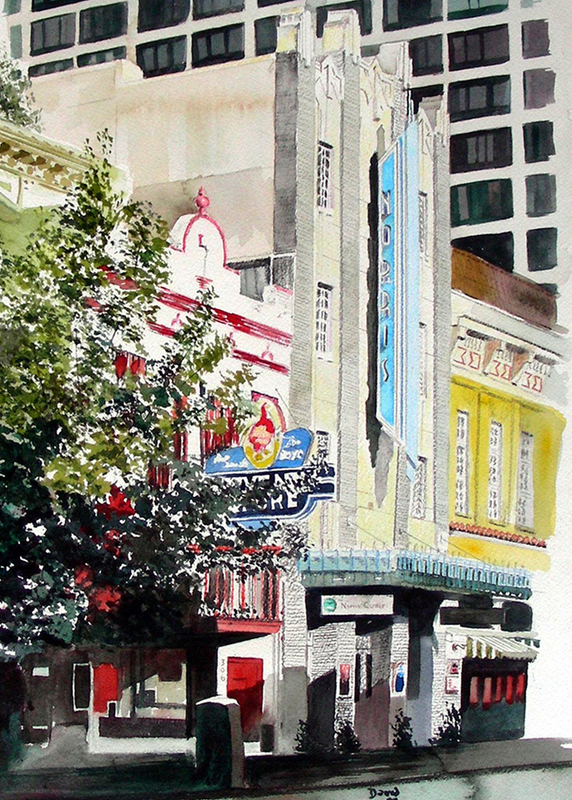 The core of my watercolor collection seeks to capture those cultural relics from my own past, because I want to remember those thriving businesses that now stand as sere architectural husks. Hopefully, I can begin my next composition today, when school is over. Henry David Thoreau withdrew to Walden Pond. David Hume convalesced at a cottage near La Fleche College. This past weekend, I had the exquisite privilege of retreating to rural Crockett, Texas. Two lovely new friends granted me access to this remote, remade “country store.” The signs are real–no replicas will be found inside or outside this rustic structure. Stepping inside will take you back to the 1950’s rural general store. Even the front screen door slaps shut with a sharp sound if you release it. Inside I gazed forever at all the products lining the shelves that I recalled from childhood. The only element missing was a cluster of farmers sitting on rockers, whittling long sticks with their pocket knives and swapping stories and local news items. I set up an easel outside on my second day in the country, right after a sweet, cleansing rain. I enjoyed the cool moist winds and the smells of the neighboring pastureland, and listened to conversations emanating from within the store while I worked at this plein air watercolor. Today I’m back at school. Progress grades are due online by midnight tonight. The class schedule was that dreaded four-class day in four different classrooms on two floors. Already I’m tired, despite a restful weekend. But the day’s drudgery has not been able to push out of my memory the sound of that screen door slapping shut on the front of this rustic store. Memories like this past weekend help me cope with the kind of days faced this year with this dreadful school schedule. It is most enriching to pause, close one’s eyes, and remember warm scenes from the past that are worth “calling up.” William Wordsworth has enriched us with his “Lines Composed a Few Miles Above Tintern Abbey.” I often wish (hope) I could do the same visually for anyone who wishes to remember the “country store” from yesterday. This weekend was filled with relaxation and plein air watercolor sketching in Crockett, Texas. 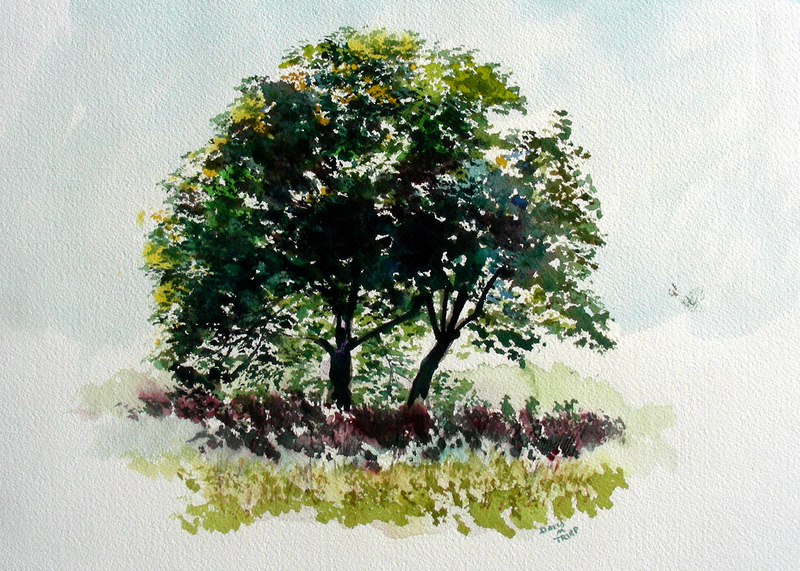 I met two new dear friends who invited me to their property over the weekend to scout and sketch subjects that they knew I enjoyed watercoloring. This is the first of two that I worked on while there (aside from taking dozens and dozens of digital photographs and enjoying engaging conversation). The sun was setting, cows were calling out for dinner, and deer were emerging from the nearby wooded area to forage in the cow pasture for food. 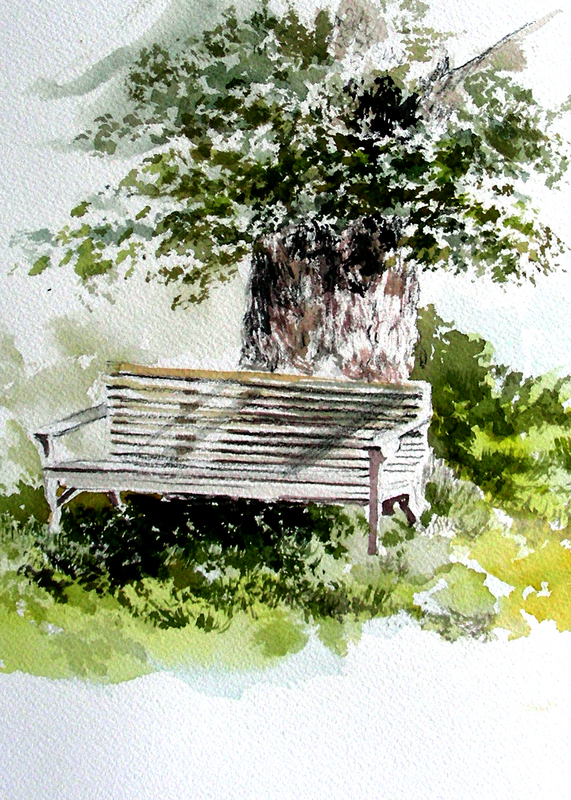 I couldn’t think of a lovelier setting, and I thought the sight of this restful bench was just the right subject to put into the heart of the composition. I’m still working to finish a pair of Harley watercolors, that I’ve already posted. Today’s schedule was too full for me to get in some real quality painting time. I’m posting this picture, because of my afternoon spent rhapsodizing over the downtown Fort Worth vistas. Here are the remnants of what used to be Red Goose Shoes and the Sundance 11 Theater. My history with Fort Worth extends only as far back as 1977, and I love to hear stories of these business establishments from locals who knew these places during their viable years. Hats off to memories that matter, and to those of you who keep them alive. I’m hoping that my near future will witness the painting of the Flat Iron building on the south side of Fort Worth, and the Ridglea Theater, now being restored on Camp Bowie Blvd., in far west Fort Worth. Stay tuned. Feeling an uplift from the quick Harley sketch I posted yesterday, I decided to try another. I began this one yesterday afternoon, and nearly have it wrapped up this evening. The setting is Luckenbach, one of my favorite places visited in Texas. The Harley I actually photographed one summer afternoon in Leadville, Colorado. I frequently patch together subjects from several locations in my watercolor compositions. With the fall weather settling in, I find myself envying all Harley riders with the time (and the bikes) for road trips. This is certainly the perfect time of year in Texas. 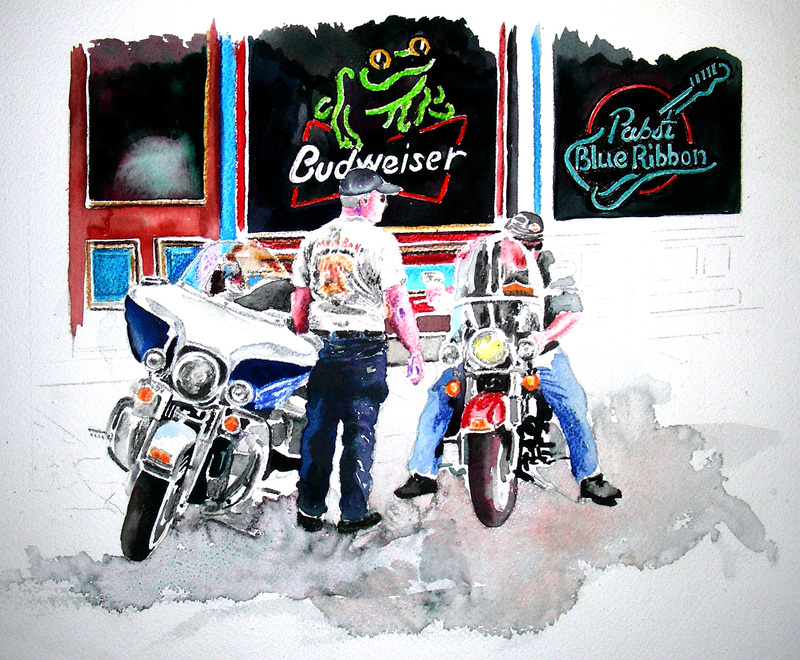 If I cannot do the biker road trip, then perhaps I can enjoy it vicariously by painting the images of such. I’m already contemplating a fourth Harley sketch. This is my third in less than a week. The Edom Festival of the Arts proved a rewarding escape from the city over the weekend. 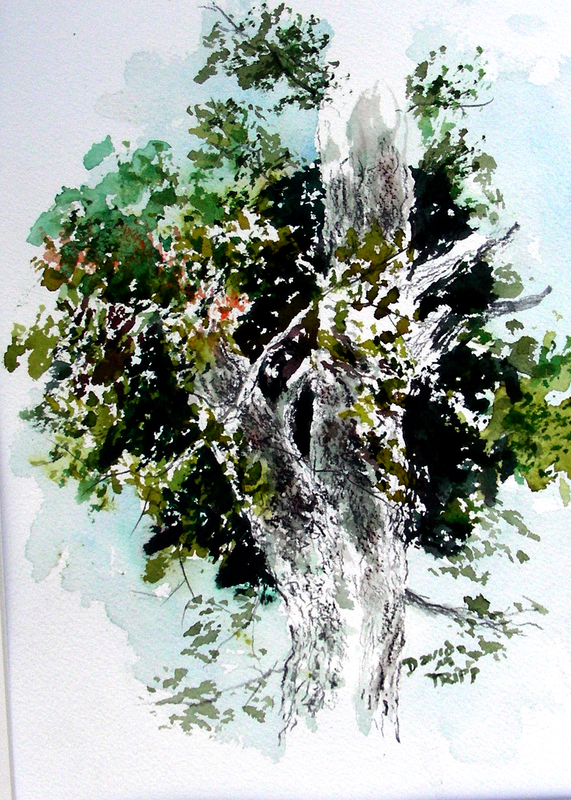 On the first day, I did a plein air watercolor sketch of a large tree towering behind my booth. 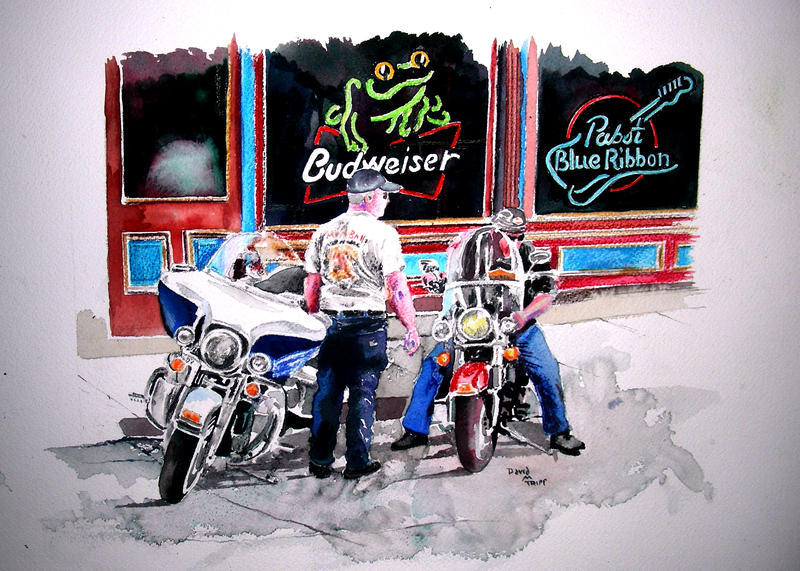 On the second day, I began work on this Harley I photographed last summer while on historic Route 66. I loved the large pack of gear attached to the rear, and knew I would get around to sketching it in watercolor. I keep trying to finish it, but alas, details keep popping up that I have overlooked (license plates, sidewalk behind, shadows beneath the wheels, and no doubt I’ll find some other unfinished areas). But I decided to photograph it anyway and send it out on the blog. I had no Internet access over the weekend. Edom is quite remote in east Texas. So I apologize that the blog has languished a few days. I’m back now, and will try to breathe some life back into it. Selling art at the Edom Festival proved a rewarding experience. Much more, though, I was enriched by meeting many new patrons, as well as renewing acquaintances with those who remembered me from last year’s festival. I also met some genuine new friends in the artist’s community, and met several former colleagues whom I had not seen in over a decade. What a reunion! Some of these wonderful people have opened new vistas for me, by inviting me to paint from their properties in east Texas. 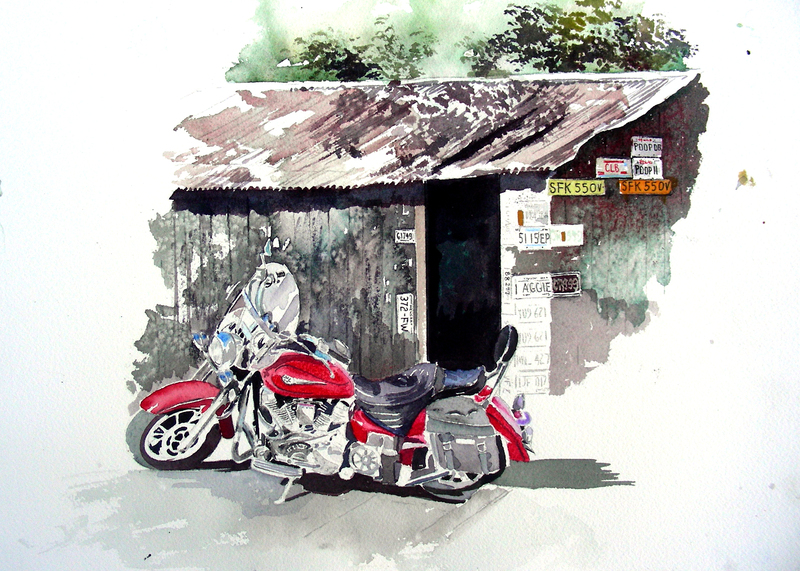 I have already been introduced to a plethora of landscapes and rustic architecture–subjects that touch me at my core. Being away from the job for a few days also provided quality space to think, to ponder. I have plenty going on in my life right now, and thankfully the next festival does not occur for two weeks (Bob Phillips Texas Country Reporter, on the Waxahachie town square). I am pondering an invitation to participate in a festival in Mineola in November, and am intrigued at an invitation to explore areas in Crockett, Texas next weekend. I’m glad the temperatures are finally cooling. I woke up to two consecutive mornings in the low fifties during the festival, and our forecast calls for falling temperatures tonight. That’s one of the reasons I’m in the garage tonight with the door open. I love watercoloring, wrapped in a quiet suburban night, and like it even better when it is not hot and muggy. Thanks for reading. More tomorrow, I promise. On a scalding hot day in the Texas hill country, I paused to photograph this pair of road-weary bikers stopping for a refresher. 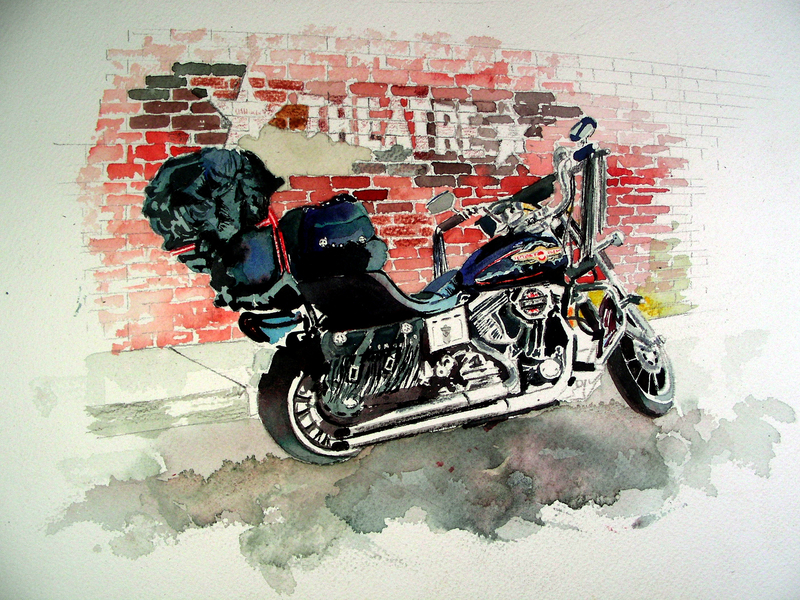 The motorcycle odyssey has always resonated deeply with me, though I have never owned a Harley. I recorded this slice of American life in watercolor, attempting to enjoy their moment vicariously. I’m glad I finished up the painting in just two days, thanks for quality time in the man cave. I have it matted in a standard 11 x 14″ mat. Just in time for the Edom Festival of the Arts. Tonight, I plan to print a sizable quantity of 5 x 7″ greeting cards of it, with the above text on the back. Thanks for reading. It’s been another good day to create.